Designed to seat up to three people, the 10 ft. Lifetime Manta Kayak is the perfect multi-purpose recreational kayak. It provides comfortable, balanced seating for solo, tandem, or family fun. With a 500 lb. capacity and the tunnel hull design, the Manta Kayak provides ultimate stability, making it almost impossible to tip over. So paddle, fish, or sail, the Manta Kayak is designed to provide plenty of fun for the whole family. The Lunex RS-1 Trailerable Boat Cover by Classic Accessories provides excellent sun protection in your driveway or on the highway. Lunex marine ripstop fabric uses an advanced grid technology to repel water and protect against dirt, bird, sun damage, mildew and tears. The Orion Deluxe Trailerable Boat Cover by Classic Accessories provides an all-season boat cover specifically engineered for trailering. High strength polyester fabric designed for extra durability and all-weather protection. full cut to allow extra room for accessories such as bow rails and running lights. The StormPro Kayak/Canoe Cover by Classic Accessories provides a heavy-duty cover designed to extra durability and all-weather protection. High strength polyester StormPro fabric designed for extra durability, fabric coating technology for max water repellency and all-weather protection. Handles strategically positioned for easy installation and carrying and storage bag included. The StormPro T-Top Boat Cover by Classic Accessories provides a heavy-duty cover designed for both long-term storage. Won't shrink or stretch, designed for extra durability, fabric coating technology for max water repellency, UV protection, mildew resistance and all-weather protection. 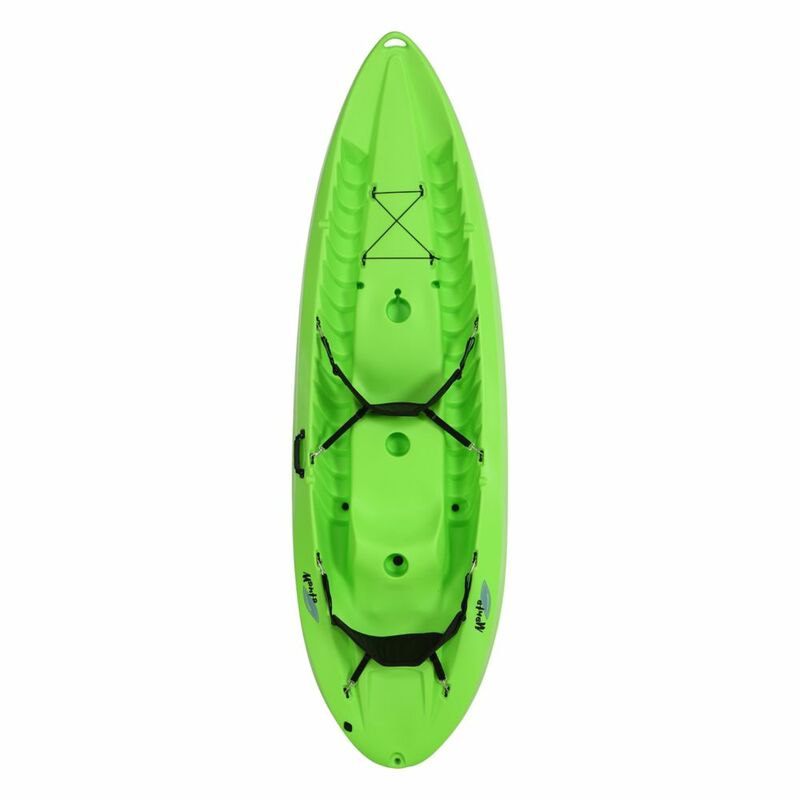 Manta 120-inch Kayak in Lime Green Designed to seat up to three people, the 10 ft. Lifetime Manta Kayak is the perfect multi-purpose recreational kayak. It provides comfortable, balanced seating for solo, tandem, or family fun. With a 500 lb. capacity and the tunnel hull design, the Manta Kayak provides ultimate stability, making it almost impossible to tip over. So paddle, fish, or sail, the Manta Kayak is designed to provide plenty of fun for the whole family. Manta 120-inch Kayak in Lime Green is rated 4.7 out of 5 by 30. Rated 5 out of 5 by Irish Rover from Cant say enough about this kayak This craft moves very well with decent speed. If you twist your hips while paddeling it can track a little off, but once you learn that it gets easy. As far as capacity I myself am 46lbs over the weight limit. I purchased this craft after losing 60lbs to help with more activity to change, and when I got down to its' capacity I was going try it out. Well my wife was taking her kayak out and I thought Im going to try it worse case I tip it over and keep loosing till I can. To my delight I got in very stable no flipping no sinking and two and a half hours of exploring. Our little guy is 54lbs and out in the lake he was swimming and wanted to climb in with me. So i pulled him up and he rode with me for awhile till he got hot and jumped back in. Again cant say enough good things about this kayak. The only down side some will say is it is big and 70lbs is heavy compared to other kayaks, but so worth it for what it can do and especially for the price. I hope this review helps others with more info or need inspiration to get more active like me. Rated 2 out of 5 by Alain from very slow, big wind anchor, can't paddle comfortably with 3 On the plus side it's relatively light, very short (10ft vs 12-16ft for others) and because it is so wide (36" vs most tandems 30-34") very stable. You also sit very high (especially back sit) that you stay dry. But there all downside when conditions are not perfect.... My biggest issue is that is was VERY slow and hard to get back as soon as the wind picks up it becomes a huge wind anchor (because it is so high/wide) and started really worrying I wasn't going to get back with the kids even though I was peddling as hard as I could, but we were drifting down wind. Some friends on ocean kayaks (single and double) where smoking us and had no issues getting back up wind (I also own a scrambler 11 for ocean diving which I use a lot. Totally different efficiency). Also there is NO WAY to peddle comfortably with a small child in the middle - I kept hitting her back even when she nudged herself as far forward as possible (see second pic - she's sitting normally there.). I wish she could sit backward (back against front person) but the seat mold isn't shaped that way. Will have to try that next time. don't believe the info videos... there is no way a 10ft can handle 3 people when most tandems for just 2 are 12-16ft. Also tracking (going straight) isn't great - you have to alternate front/back of you will sigg-jagg all over. Ton of rocker to the boat (= slow). If you're on a flat lake with no wind and want to just goof around, yeah it's a great very compact and dry kayak. Otherwise a liability IMO as soon as you have any wind. Going up for sale to get a long and narrow 2+ people that sits lower in the water. Rated 5 out of 5 by Steve from Stand behind their Product!!! Purchase the manta kayak.....great product....great warranty....Great staff....I would strongly recommend their products. Buy with peace of mind! Rated 2 out of 5 by Scottie from Manta needs KEEL Have owned for a few years, pretty stable, had to add better back rests. The lack of a keel (the bottom is quite rounded both front and back) won't let you track (go straight.) Any speed above a crawl and it turns dramatically left or right depending on who knows what. Hard to imaging you guys didn't put one in the water and paddle it. Has a small leak somewhere I can't find. Rated 5 out of 5 by 23dest from Great Quality I'm extremely happy with mine. It's super well built and will last a long time. I love the lime green color as well.